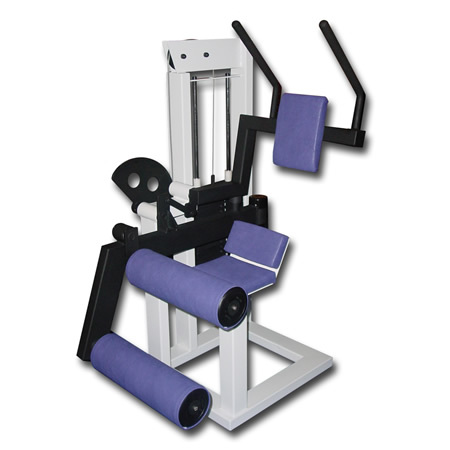 The seated ab exercise machine is a popular piece of abdominal exercise equipment, and it can be found in most large health clubs and fitness facilities. If you're read my overview page on all ab machines, then you know that ab machines by themselves will not get rid of the fat around your stomach. Spot reduction is the #1 Ab Exercise Myth. You cannot lose abdominal fat simply by exercising your abdominal muscles. But, even though the seated ab machine cannot magically get rid of stomach fat, it can be used to strengthen your abdominal muscles. Personally, I rarely use this type of abdominal exercise equipment, and I rarely recommend it. But, if you like it and feel that it works your abdominal muscles, feel free to continue using it. The seated ab machine may be more comfortable for people who have trouble getting onto the floor. Also, if you have neck pain or neck weakness the seated ab machine takes some pressure off the neck muscles because you do not have to lift your head up against gravity. It is also easy to progress your strength using this type of ab machine because all you have to do is add weight. It's not my number #1 choice for ab training, but it can serve a purpose. Range of motion is restricted when you use ab machines, and that is one of the major reasons, I prefer exercise ball ab exercises, body weight exercises, floor abs exercises, yoga, and pilates. The setated ab exercise machine moves in a fixed path, and your body must adapt and move along that fixed path. Generally you will hinge over a pivot point and over stress one area of your abdominals and spine. Another challenge when using a vertical ab machine is that the arms tend to work just as hard as the abs to pull you forward. In fact when many people use this type of ab machine, they find that their arms get tired before their abs get tired. Ab machines don't challenge stability and coordination. Ab Machines can strengthen your abdominal in a fixed path, moving only forward, with no balance challenge. But sports and functional activities require coordination and stability. Above are just a few reasons I prefer other methods of ab training. My advice is that if you've only been using a seated ab exercise machine, try some new ab exercises from my Directory of Abdominal Exercises. Ab machines can help to strengthen you abdominal muscles, but they are one dimensional. 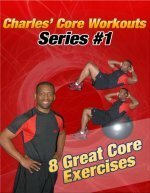 Use a variety of movement in your ab workouts, or try one of the free ab workouts on this site. Hope that helps give you a better perspective on this piece of abdominal exercise equipment.